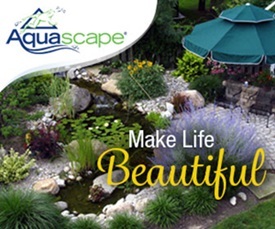 Do you start to crave green, living things this time of year? I miss the leaves on the trees, the flowers in the yard, and the vegetables in the garden. I have a tendency to start buying house plants midway through winter to satisfy my earthy craving for greenery. I try to find pretty containers for my plants and saw a couple photos on Pinterest that showed books converted into planters, which I thought were really unique! 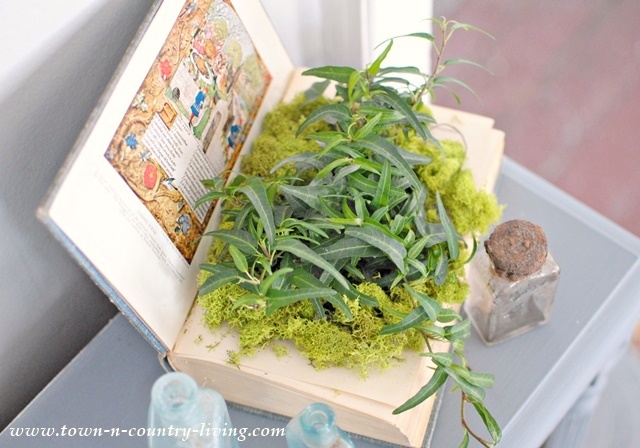 So I found a cheap text book and am ready to show you how to make a book planter. I love this look! 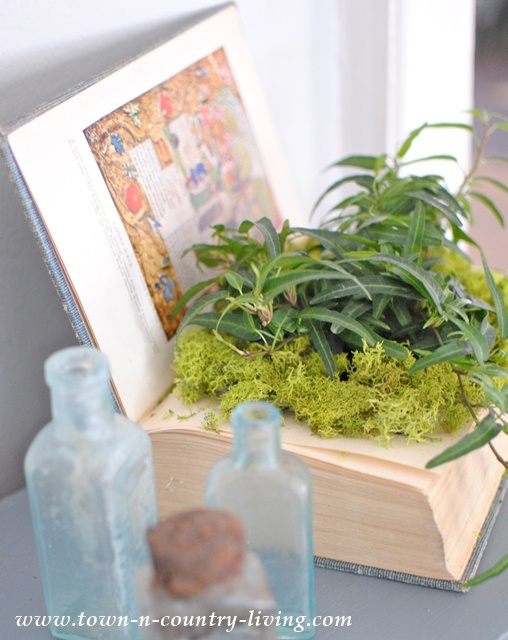 Hopefully you’re not freaking out that I turned a book into a planter. It’s not an antique book, and it’s not a book I’m going to read. So I decided to turn it into something useful. 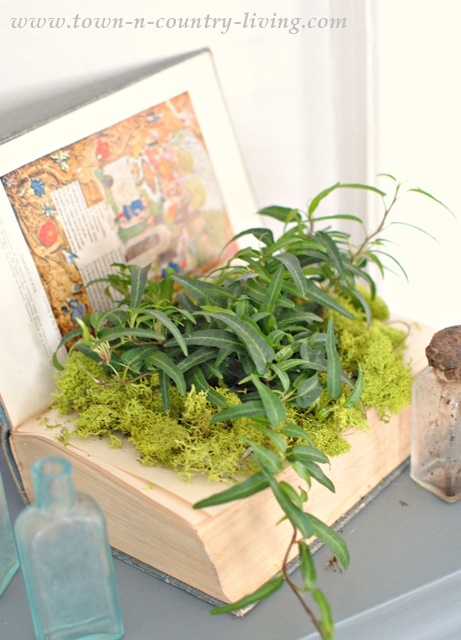 I used a trailing plant for this project so it would eventually spread and spill over the edges of the book pages. Bright green moss adds additional texture and color. Using an exacto knife, cut a rectangle in the top few pages. I didn’t measure it, I just eyed it. It doesn’t have to be perfect because the plant is going to cover the entire hole. 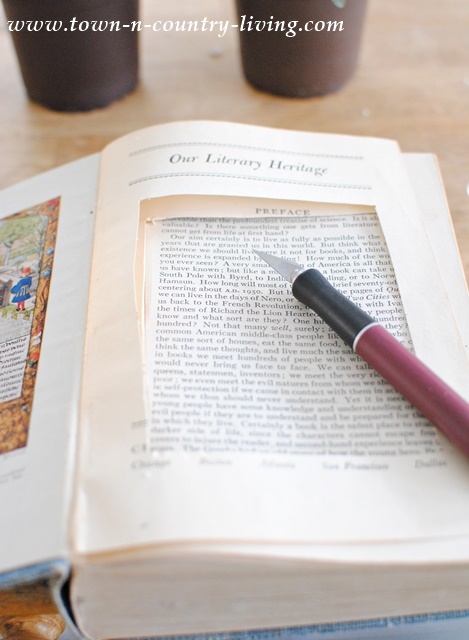 Turn the cut pages as you work, leaving a few of the cut pages to use as a guide for the cutting more pages. 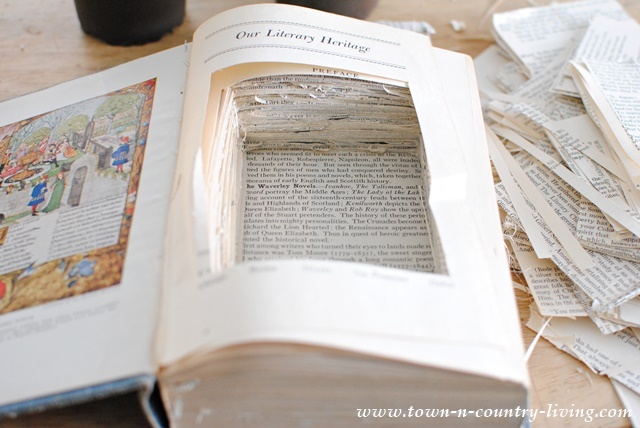 Just press the exacto knife down into several layers of pages as you slice and cut. Then take out the cut rectangles, which you can save for a craft project like the book page garland I made this past weekend. 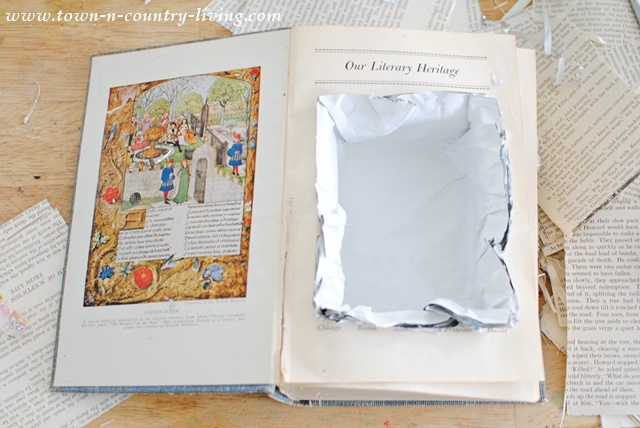 Once your rectangle is cut almost to the back of the book, line the hole with parchment paper. I used parchment lined with tin foil on one side. Cut the edges of the paper so that just a bit extends over the top of the first page. 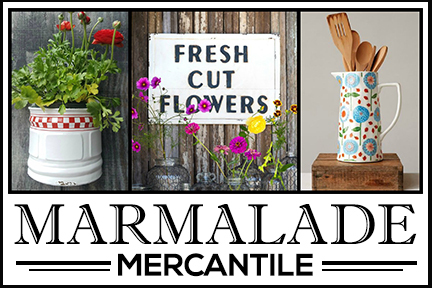 The parchment paper will protect the pages from water and moisture. 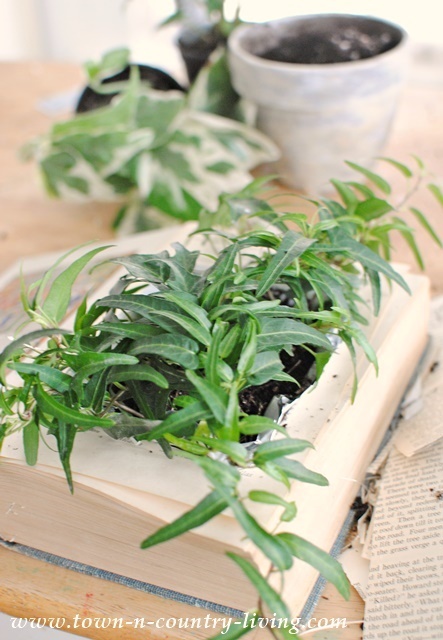 Then place your plant into the book and add soil as needed. Lightly tamp down the soil surrounding the plant. To hide the rough edges of the parchment paper, stuff small pieces of moss at the edges of the hole. 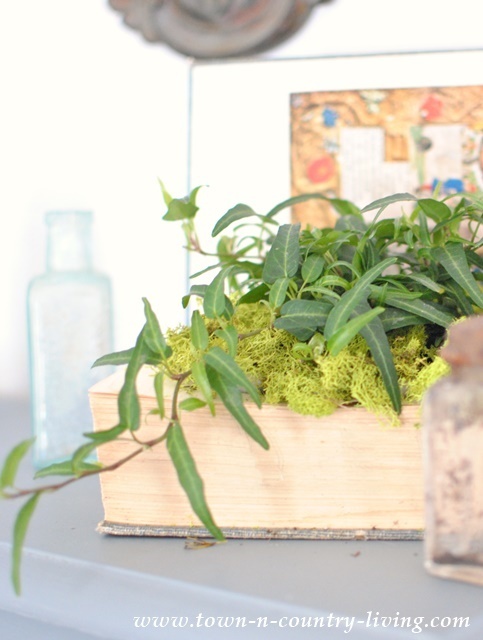 You can find the moss at a craft store and it typically comes in a few shades of green. Water the plant slowly and carefully. You don’t want to get water on the pages. I chose a book that had a colorful image on the inside of its cover. I like the way it looked when the book was open. So that’s how to make a book planter, and it only took me about an hour complete! Thanks for sharing this! I love it! And your old book! Hefty reading that fat book! Your pics make it look easy, so out to my shed for a nice fat book! 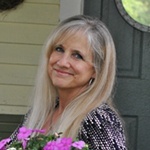 Following along with you just wanted to say Hi and thank you for helping me to find fun things to do!! Very creative! A nice alternative to the usual planter. I think this could be a wonderful start to a new vignette. Thanks for the great idea! I love this, I shared it on my Facebook page and Pinned. I am thinking I would like to do succulents in one. My future daughter-in-law is dropping by tonight to see all the fun stuff I have bought for the wedding – I am in charge of the Candy Bar and the seat assignment table. One of these book planters will be perfect. I am going to make one today so she can see it. Jennifer, this is an awesome idea!! I love this so much Jennifer! 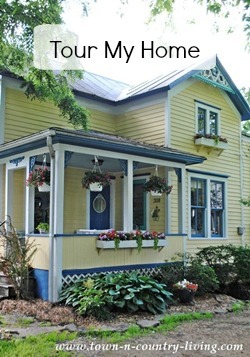 So fun that it got featured today at Midwest living!